Experienced cyclists know that the care of two-wheeled machinery significantly increases its service life. The focus for prevention should be given to the suspension of the Bicycle – wheels and transmission. It is particularly important to timely and regularly clean a bike chain and razor lubricant. One has only to forget about the service chain, and the bike will cease to function normally. Between the links is formed of an abrasive mixture, which includes particles of dust, sand and residues of old grease. This mixture over time actively and aggressively affects the metal of the chain and sprocket of the bike. The result of the mating parts deform, the chain stretched and eventually becomes unusable. Proper and timely lubrication helps to cope with these problems, but only in the case when it is applied on clean and properly prepared surface. 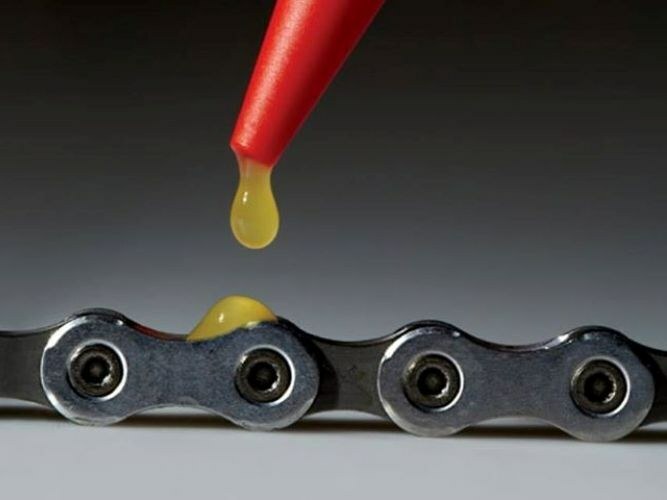 Before lubricating the chain it is recommended to remove from the bike and some time to put in a container of solvent. For this purpose suitable conventional kerosene or special liquid, able to dissolve the old grease. There are other ways to clean the chain, not allowing to remove it from the bike. Today in specialized stores you can pick up a special device to clean the chain. It is a case or box, through which passed and dragged the chain by rotating the pedals. Built into the case of such machines the rollers and brushes effectively clean the parts from contamination. The care chain should be regular. It largely depends on how often you use the bike. In General, clean and lubricate the chain need each month, and during long rides on bad roads – at least once a week. In no case should not be applied fresh grease to a dirty chain, as this will only increase the abrasive action of the old layers. Each procedure chain lubrication must be preceded by thorough cleaning of dirt. The recommended frequency of lubrication of the chain is largely determined by the form used for this purpose substances. Among cyclists, widespread melting parts in the lubrication of graphite. For this shot, the chain is placed in a metal container with a graphite lubricant and keep the fire within 10-15 minutes. This processing allows you to apply lube to even the most remote places. Repeat this procedure typically every 350 to 400 km drive, and when operating a Bicycle in the rain you can do it even more often. The cyclists today can afford to choose grease on the chain from a wide range of such tools, focusing on their financial capabilities and operating conditions of equipment. Very comfortable bike grease, which is sold in the form of bottles with a narrow "spout", although if desired it is possible to use a medical syringe. To bury the grease should be in the places where links connect directly, avoiding contact of the composition on the outer side of the chain. Excess substances are removed with a clean cloth. Such lubrication under moderate operating a Bicycle performs its function for a few weeks. Especially convenient in use are considered universal lubricant aerosol type. They can be used in all weather conditions. Use a spray lubricant very simple: it is enough to send a spray device for connection sections and lightly spray them. To use a similar grease more frequently than normal, relying on the extent of the contamination chain.